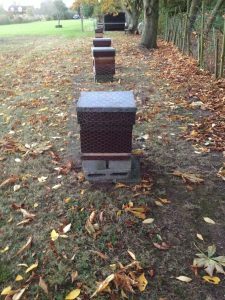 As the cold of November arrives the bees will hunker down in a cluster hopefully with plenty of pollen and other food above them so they don’t have to move far to get their fuel to keep the colony warm. In the centre of the cluster the Queen and her attendants will be breeding young but only in small numbers as the winter closes in and restricts all movement from the hive. The beekeepers role at this time is to leave them well alone and to just ensure they have access to plenty of stores (please see the article on feeding candy) and keep the hive well ventilated. If you take the roof off a hive and find it is wet with condensation you need to clear the vents in the roof so the air can circulate around above the cluster. The problem is of course the bees will seal the ventilation holes in the roof vents with propolis and then spiders and earwigs make a home in the resulting space restricting the airflow.A quick scrape of the gauzed zinc a hot flame from a blow lamp soon solves all of that. If all is dry on the inside of the roof leave well alone. 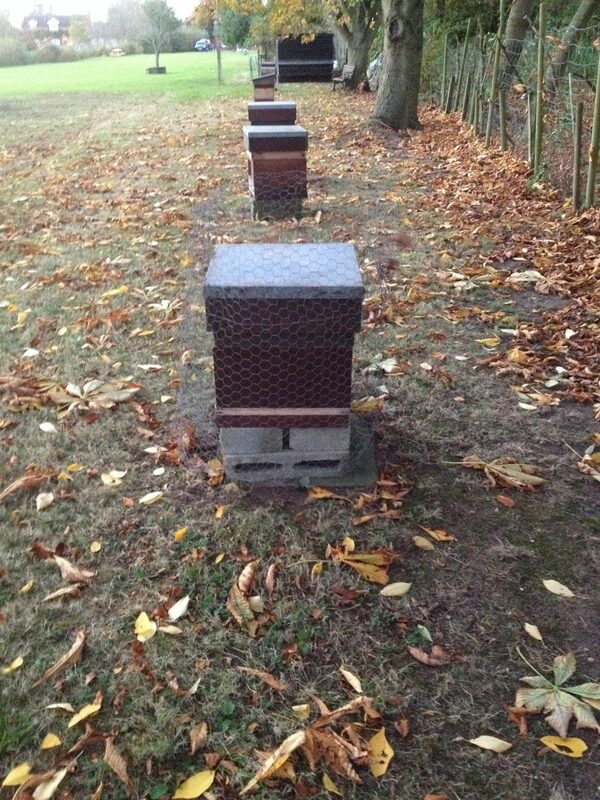 The sharp frosts will now kill off the remaining worker wasps (although last year they were still around in January due to the mild Autumn and no frosts to speak of) but the mice will still be on the lookout for a comfortable dry home for the winter so make sure your mouse guards are still in place. The other big problem is the Green Woodpecker so make sure you have the hive protected by chicken wire which must stand proud of the hive so the pesky birds cannot sit on the wire and drill their enormous holes in your lovely cedar brood chambers. If you cannot get hold of chicken wire then plastic sacks will do a similar job. You can either pin it to the outside of the brood box remembering to cut a hole so the bees can get in and out or cut the sack lengthways and pin two of them under the roof again remembering to cut a big ventilation hole so you don’t create a condensation trap. The whole idea is to stop the Woodpecker from having anywhere to perch on so he can peck away at the side of the broodchamber. If you want to get really fancy you can cut the lower end of the plastic sack into inch long strips which will blow in the wind and cause even more havoc with the Woodpeckers. 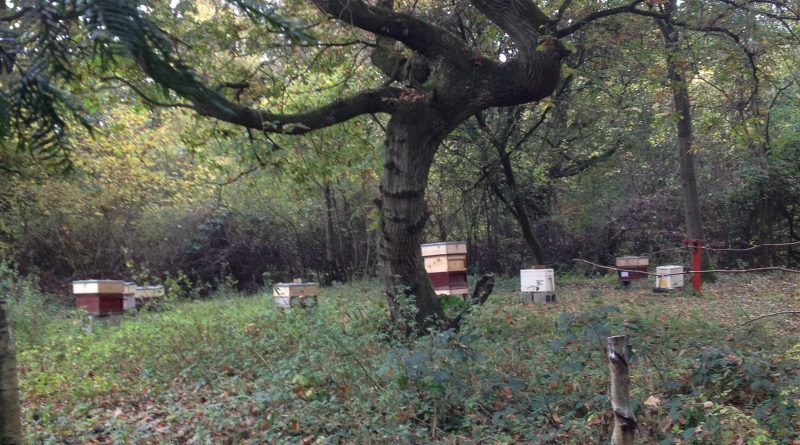 If in exposed areas or overwintering in Poly Nuc hives ensure the roofs are weighed down (house bricks work well) or they are strapped tight to the stand so they cannot be knocked or blown over. It is also a good time to render down any old wax you have to clean it up ready for the spring shows where you can exchange it for foundation. Another benefit at this time of year is that the small of hot wax and old honey will not attract bees or wasps. The wax should be as clean as you can make it I always steam mine through a muslin bag which clears out a lot of the impurities and leaves a nice yellowish coloured wax. In the future an article will appear on how to make your own device for rendering down old combs or capping using a steam wallpaper stripper it is so much easier. It is recommended that old brood frames are destroyed and that you don’t try to recover the small amount of wax they contain. The danger is that they could contain viruses and that may survive the steam process. They frames do make good firelighters though. If you have the time you can wash them in Soda Crystals, which will kill the virus, but to me ordering “seconds” from the Spring Convention at Stoneleigh seems a much easier option. With a bit more time available why not come along to the Association winter meetings at Luddington village hall and borrow a few books from the Library. Just remember the bees don’t read the same books you will be doing.